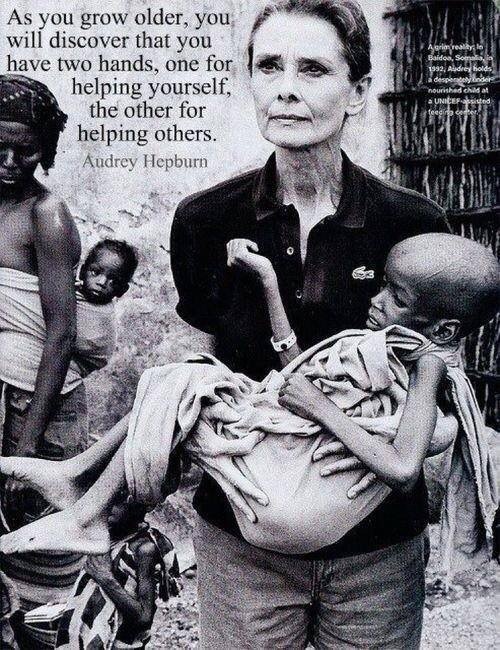 Audrey Hepburn made remarkable decisions about how she spent her time in her later years. They represent the things I think my mother would have done if she’d had the physical capacity. My mother spent the second half of her life crippled, weak, and vulnerable, yet still strong and generous in spirit. I remember her picking up a young hitchhiker, taking him home and feeding him, and sending him off with warm clothes and a blanket. He was on his way home. That’s who I want to become. The needs here are as real as they are in other parts of the world. As Mark and I headed out last night to Montana with another load (we’ve been going every weekend just to smell that clear, rich, life-giving air), we dropped by Safeway to fill a prescription. A homeless man sauntered in from the cold to use the bathroom. He was grimy, aimless, hopeless, lonely. Others turned and stared as he walked by. All I could think was, “That’s somebody’s son. He was someone’s beautiful baby.” I’ve never felt so helpless. I can’t solve the world’s larger problems, but I can show one small kindness at a time. I can help other hitchhikers who, like me, are trying to make it down the road toward home. Next Next post: How Would You Improve This Cover Letter?